After rounding the White Cape in early October 1606 and sailing south past Malle Barre, Samuel de Champlain charted Port Fortune (present Stage Harbor at Chatham, MA) which the expedition later dubbed 'Misfortune' due to several violent and intense encounters with the local Native American tribes. 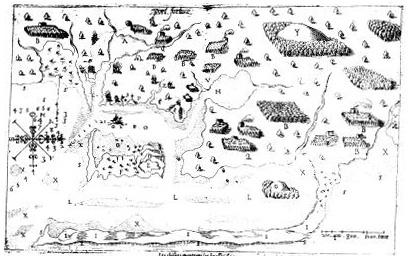 Champlain's drawing of Port Fortune during the Indian skirmish, 1606. "Here there is much cleared land and many little hills, whereon the Indians cultivate corn and other grains on which they live. Here are likewise very fine vines, plenty of nut-trees, oaks, cypresses, and a few pines. All the inhabitants of this place are much given to agriculture, and lay up a store of Indian corn for the winter, which they preserve in the following manner. "Their lodges are separated from one another according to the extent of land that each is able to occupy. They are lofty, circular, and covered with matting made of grass or husks of Indian corn. Their only furniture consists of a bed or two raised one foot from the floor, and made of a number of saplings laid one against the other, whereon they place a reedmat, in the Spanish manner (which is a kind of thick mattress two or three fingers in depth), and upon this they sleep. They have a great many fleas in summer, even in the fields. "Some eight or nine days later, on the Sieur de Poutrincourt's going out walking as he had done before, we observed that the Indians were taking down their wigwams and were sending into the woods their wives, children and provisions, and other necessaries of life. This made us suspect some evil design, and that they wished to attack our people who were working on shore, where they remained every night to guard whatever could not be taken on board in the evening except with much labour. "We came back very quietly to our pinnace, accompanied by a few Indians. On the way we met with several small troops who were gradually collecting together, fully armed, and were much surprised to see us so far inland, little thinking that we had just made a tour of from four to five leagues through their country. When passing near us they trembled for fear lest we should harm them, which it was in our power to do; but we did nothing, although we were aware of their evil intentions. On reaching the spot where our men were at work, the Sieur de Poutrincourt asked if all things were in readiness to oppose the designs of these rascals. "The next morning, the fifteenth of October, the Indians did not fail to come and see in what state were our men, whom they found asleep, except one who was before the fire. Seeing them in this condition, the Indians, to the number of four hundred, came quietly over a little hill, and shot such a salvo of arrows at them as to give them no chance of recovery before they were struck dead. Fleeing as fast as they could towards our pinnace, and crying out, "Help, help, they are killing us," some of them fell dead in the water, while the rest were all pierced with arrows, or who one died a short time afterwards. These Indians made a desperate row, with war-whoops which it was terrible to hear." By November 14, 1606, the French expedition had returned to Port Royal. With de Monts monopoly on fur revoked, Champlain would now turn his attention to the north and west, abandoning the idea of establishing a settlement along the New England coast.